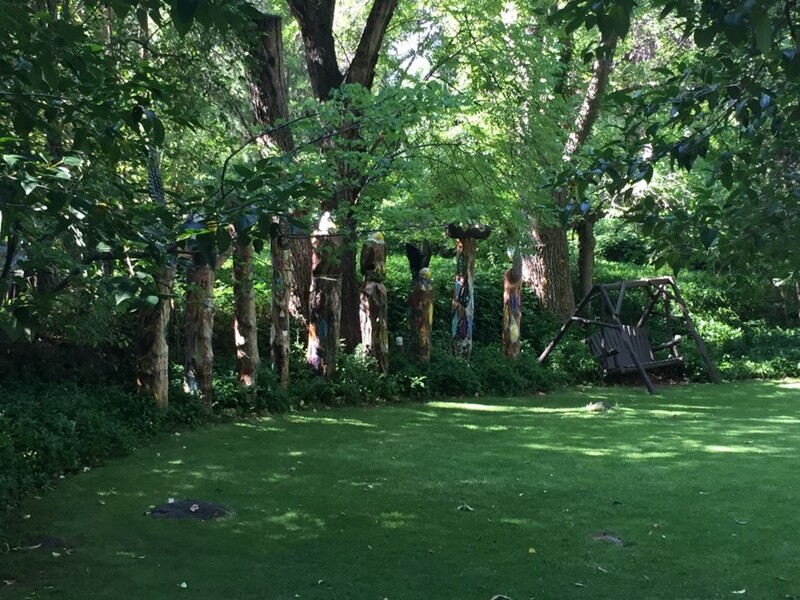 Artful Sedona! That’s what the theme is for this post! You see, I was born and raised in Phoenix, Arizona, but never visited Sedona. I know, I know. I’m a bad native. I’ve always taken it for granted that it’s here in my own area. 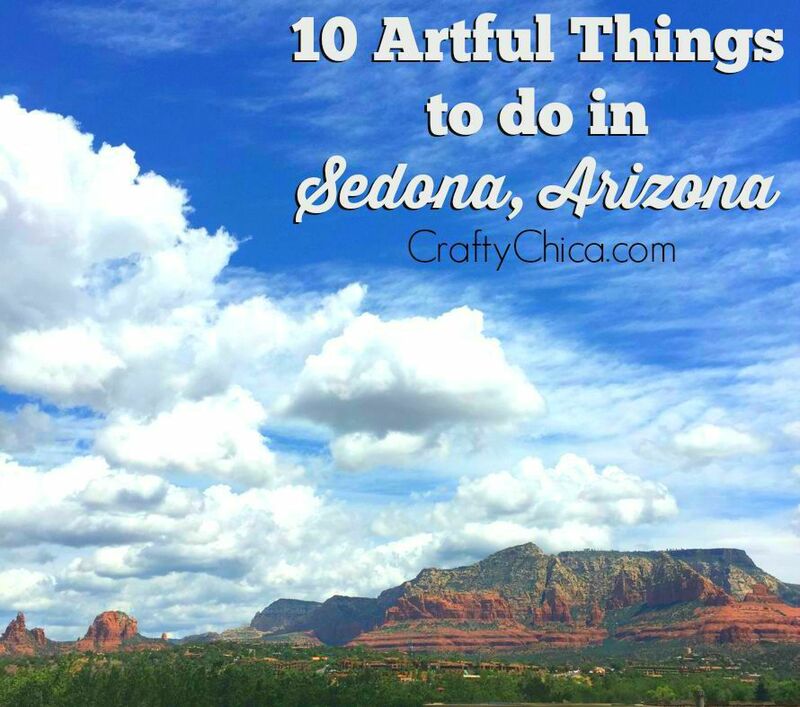 Now that I’m getting (*clears throat*) a bit older, I’m making list of places I want to see in my own state and Sedona was at the top of the list! So last month when KIA reached out to see if I wanted to test drive the 2016 KIA Sedona, I thought, YES, and I’ll drive it to…Sedona! 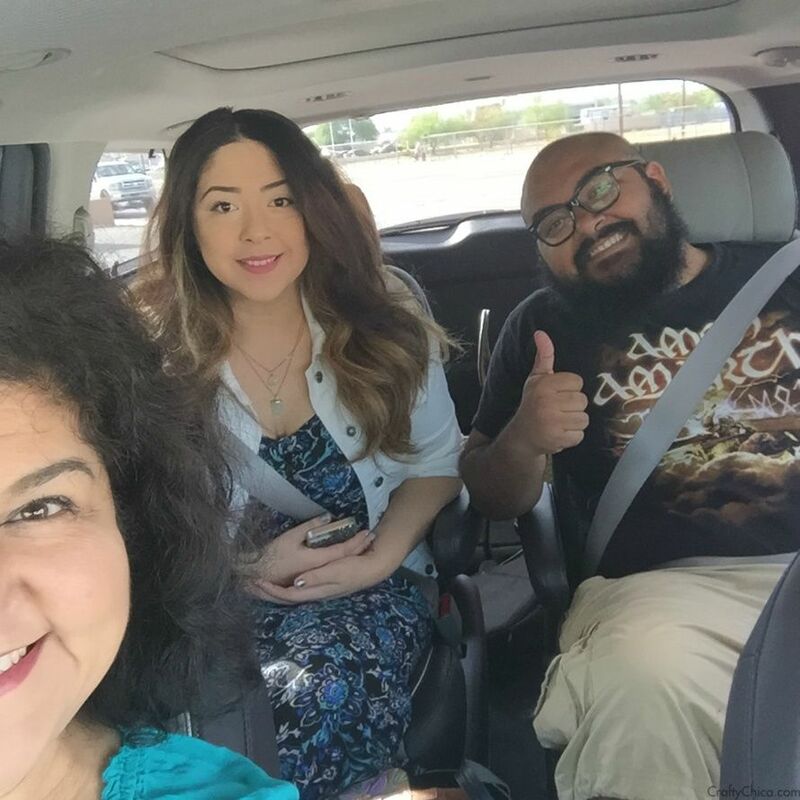 Here is my week’s adventures with the KIA Sedona and now I’ll focus on our family bonding trip! This was the first family vacation since our Disneyland excursion last year. As the kids get older and start their own life journeys, it’s difficult to wrangle them away for a day, much less a weekend! Luckily DeAngelo and Maya were game for this idea, and so was Patrick. Sedona is known all over the world for its beauty, southwestern mystique and soulful charm. But as a crafty chica, I wanted to really hone in on what would apply to my family of creatives. 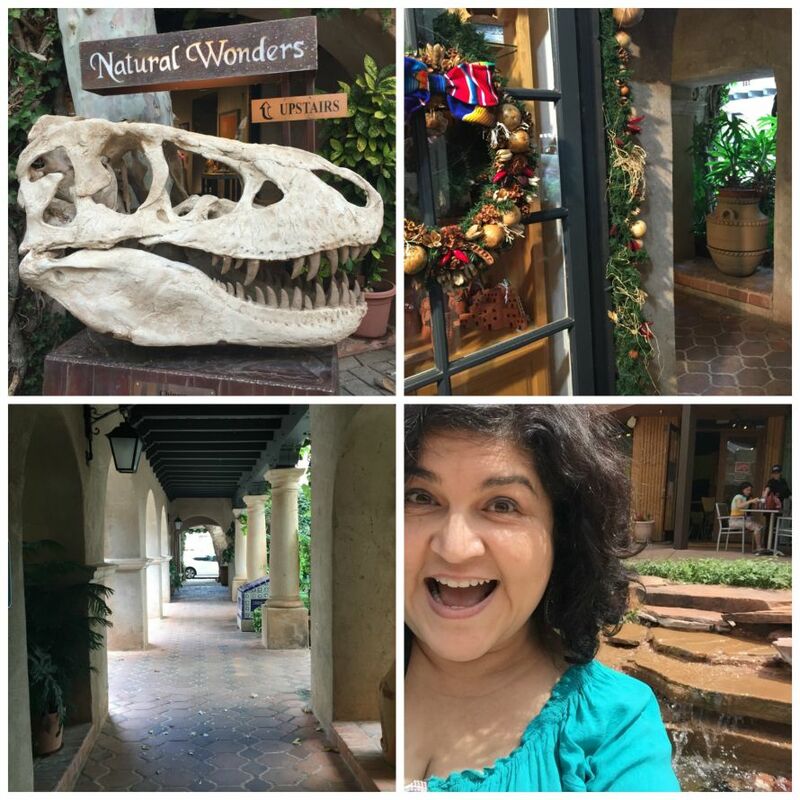 I didn’t want to shop for cowboy boots or snap a picture of my aura (although that does sound intriguing) – I know Sedona is much more than that. 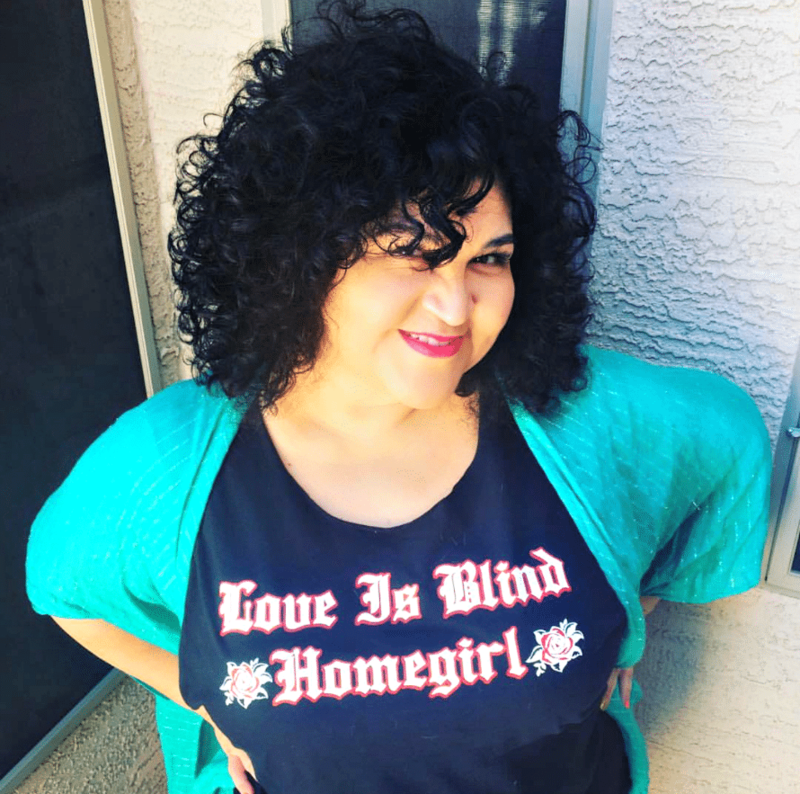 Using my notes that I took at some recent blogging conferences, I crafted my very first travel pitch and reached out to the Sedona tourism department. I explained who I was, what I did and what I wanted. And guess what? 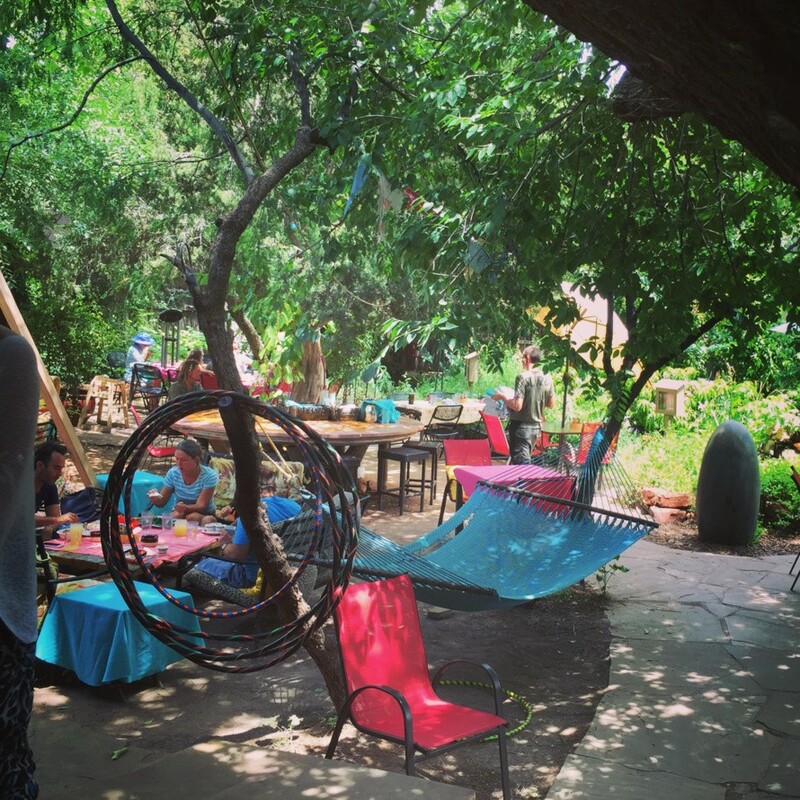 They were just as excited at the thought, and helped me curate a custom itinerary of artful Sedona, then reached out to these businesses to host us. So scenic, breathtaking. Have your camera ready, and take time to pull over and snap some pics. It doesn’t even look real, it looks like a painted backdrop. The beauty really does make you feel so tiny in the big scope of things. So appreciative. But save time for camera-free action. Just look out the window and daydream. Put on your favorite music as a soundtrack so you seal the experience into your memory. We left at 8 on a Saturday morning and took the I-17 from Phoenix. It only took a little more than two hours. Make sure to check for traffic alerts. 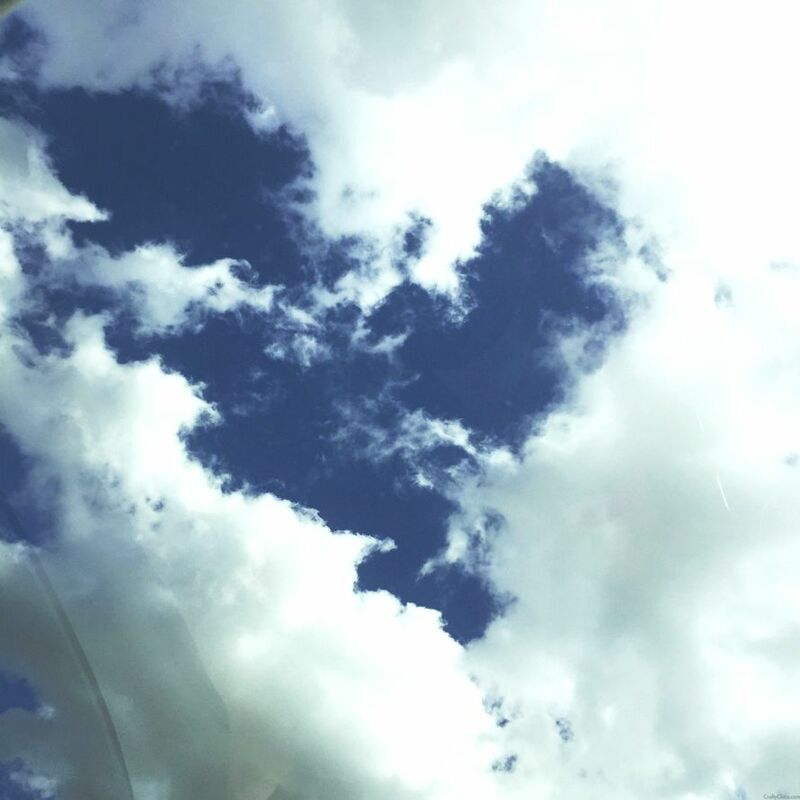 There were a lot of clouds that day and at one point, I opened the sunroof on the KIA Sedona and right there in the sky was a giant heart! Do you see it? I also posted this on Instagram and someone said they also saw an angel. I can see that too! I felt like all the energy around us was happy that we were doing something together as a family. The sky smiled down on us! The sky made a heart for us! 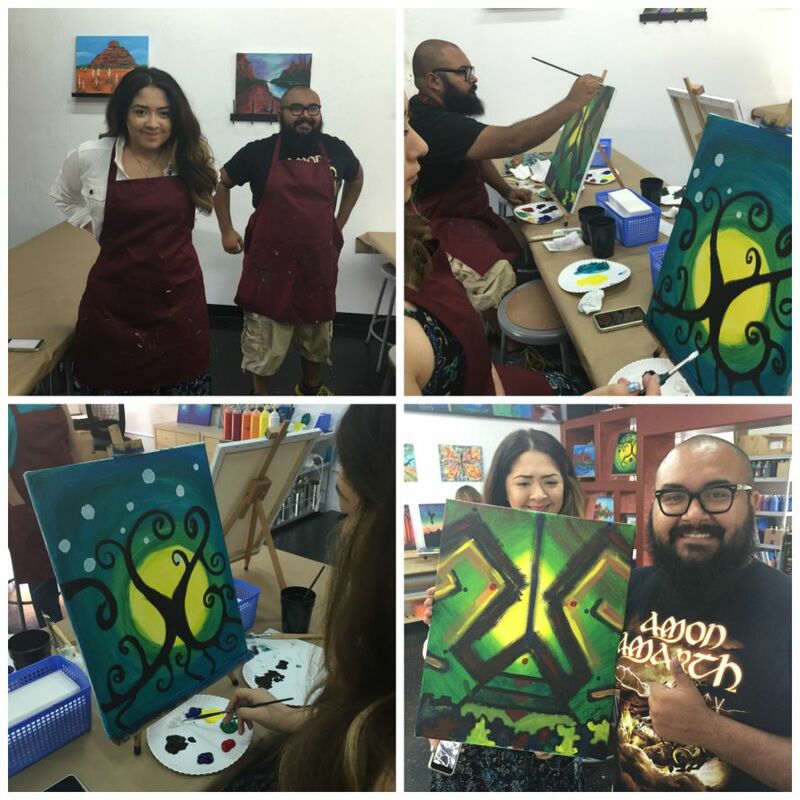 Once we got into town, we made our way to our first adventure – Painting Escapes! This was so cool because it was just the four of us in the classroom. Patrick was working on drawing a coloring book, so he stayed in the background while Maya, me and DeAngelo followed along with the teacher to create a canvas. I teach a lot of workshops, and it felt great to relax and follow along with someone else’s instructions. I learned a whole new perspective! 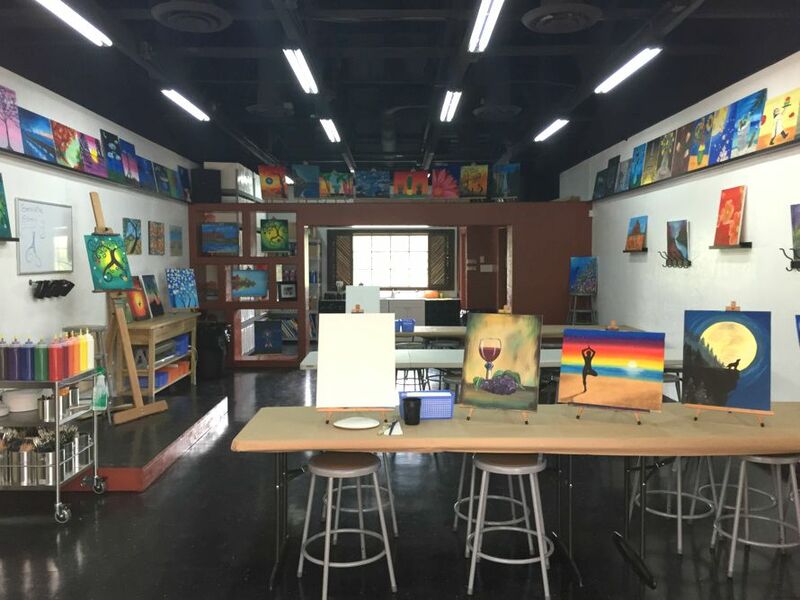 Painting Escapes has at least a hundred designs to choose from, and you can sign up for a solo session, with a few friends or as a party. Our teacher had us paint an energy tree. This is something I would have never thought of to try, very abstract and very colorful. I followed along and my canvas came to life. I wondered if the kids would get into it (they never make stuff!) and they sure did. This was the set up in Painting Escapes as we walked in. Maya painted her tree and then turned it upside down and liked it better. So she finished it up that way. DeAngelo totally went in his own original direction. Art has no rules! Maya and DeAngelo. Typical siblings! Here we are with our finished canvases. 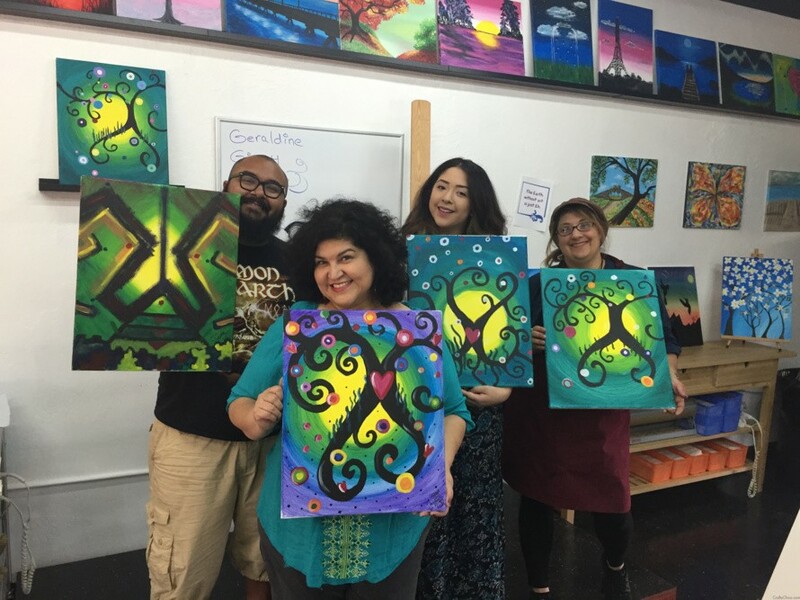 The painting in the upper left corner was our model canvas, but we all took it in our own direction! My favorite part of this session is that the kids were really proud of their work. NOTE: That is our teacher, Geraldine on the right. She was so cool, she is an artist also, check out her shop at her store MyMagination.etsy.com. 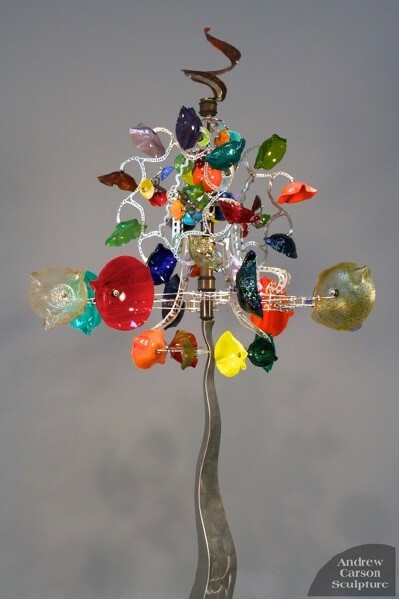 These are a collection of crazy, colorful wind sculptures that are made from found objects and blown glass. Each one had its own personality and story to tell. The pictures don’t do them justice at all. Now that I’m working with ceramics and kiln, I appreciate the art of blown glass even more. Each one of these tells its own story, and is made to pick up wind in opposite directions. As bright and cheery as they look, a lot of engineering went into them! I’m really happy with how this Vine came out. Patrick and the kids kept hollering for me to hurry up as I walked all over the compound shooting video on my phone. It was worth it, this is exactly how I want to remember seeing these brilliant works of art. So detailed. So mesmerizing! I put the Vine to a new song we listened to in the car on the way up. In the same complex as Painting Escapes is this Mexican restaurant. The dishes come heavily-loaded – you’ll want to either share a meal or take some home. I didn’t know what to expect, Mexican food in Sedona? But I gotta say, the chicken and beef machaca recipes are slammin’. Like they are straight from a Mexican wedding, all savory and shredded. 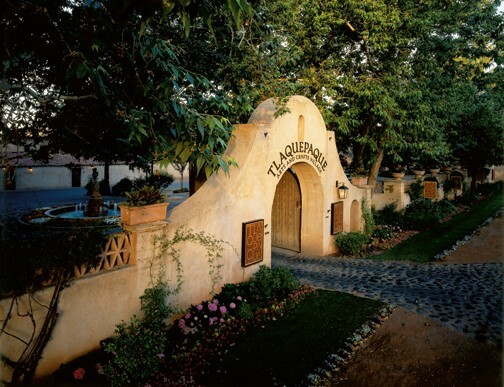 The menu has many traditional items, but you’ll also find dishes such as salmon tacos and catfish rellenos. I felt so proud that I stuck to my points for my Weight Watchers plan via a taco salad, but then we decided to order a dessert and share. 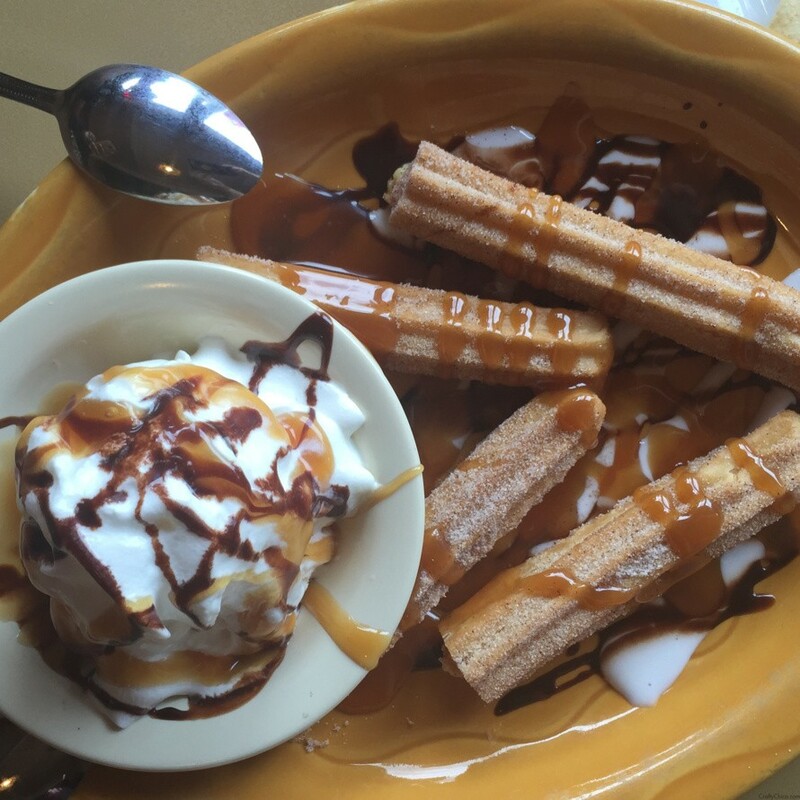 We went for this churro plate and had zero regrets. Even if you just go for coffee and churros, it’s worth it. They come drizzled with caramel sauce with a side of ice cream. This was my FAVORITE stop on our entire trip, well, shopping wise. Those of you who have been here will know exactly what I’m feeling. The venue looks like a village from the 1800s, lots of brick arches and hidden walkways. Within the space are a variety of shops featuring handmade items. One store, Esteban’s, was filled with all ceramics, and I just about fell over. I left with so much inspiration and ideas. Then I wandered into a store called Feliz Navidad: A Christmas Store. It lives up to its name and sells ornaments from artists all over the world. I’m definitely going to send them samples of my ornaments, I could totally see our handmade art there! See, this is what happens when you go to Sedona. It enchants and lures the soul, you find a spot where you can fit in. I found myself critical thinking of how we could move there and sell our art. Then I realized that most of the people I met so far had the same experience and they followed through! Corporate, big city living took its toll so they downsized, packed up and moved to the majestic red rocks. Lots of things to see and do here, dozens of shops, lots of prime selfie photo opps, cool people chillin’ out. Plan to stay a couple hours to get it all in. 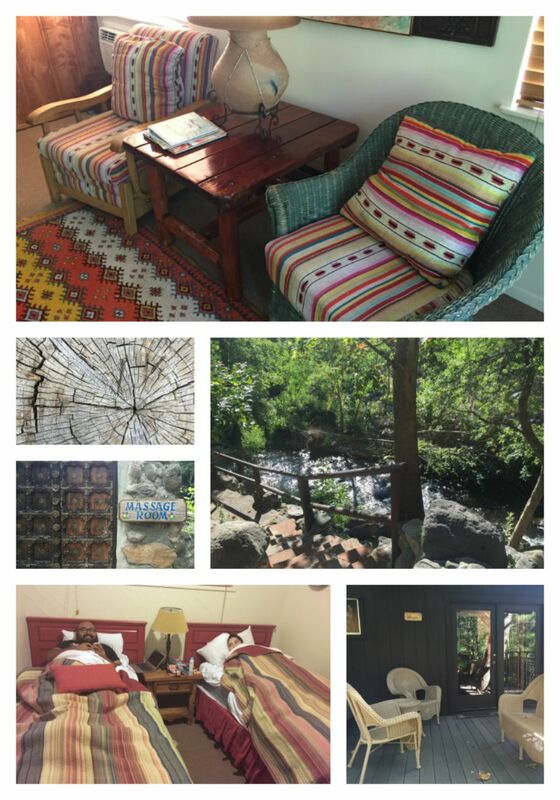 If you want to experience the ultimate experience of Sedona, you must stay in a cabin within the lush greenery of Oak Creek Canyon. We were lucky enough to have scored a family-sized cottage at Briar Patch, located on the banks of Oak Creek. Nine acres big, it’s been around since the 1930s when it served as resting spot for Hollywood actors and filmmakers who were shooting westerns in Sedona. There are a total of 18 cottages/cabins on the property, plus areas for mediation, massage, and seating along the bank. They offer breakfast and live music, and even an array of books and games to keep yourself busy. The best part? No internet, phones or TVs! This is the front entrance and below is the front part of our cottage, Wren. THIS is where you want to stay if you need to finish that big project. No interruptions at all, just peace, quiet and gorgeous weather. 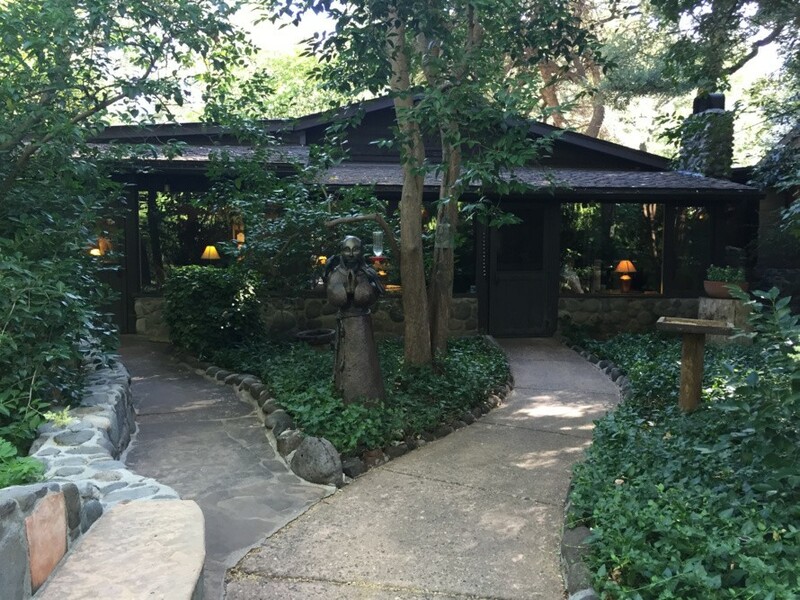 There are many outdoor seating areas where you can go to write that book, draw or sketch, or just write down your life goals. Hand painted totems! I so wanted to go roll in this grass but the sprinklers were on! TIP: You need to book your reservations early for Briar Patch, space and massage services fill up fast, especially during summer months. 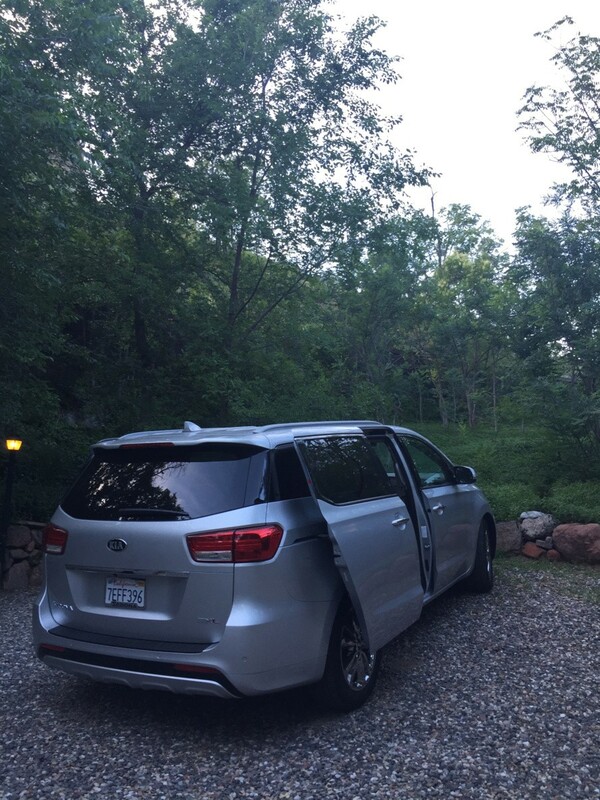 Even our KIA Sedona took a moment to enjoy the beauty! 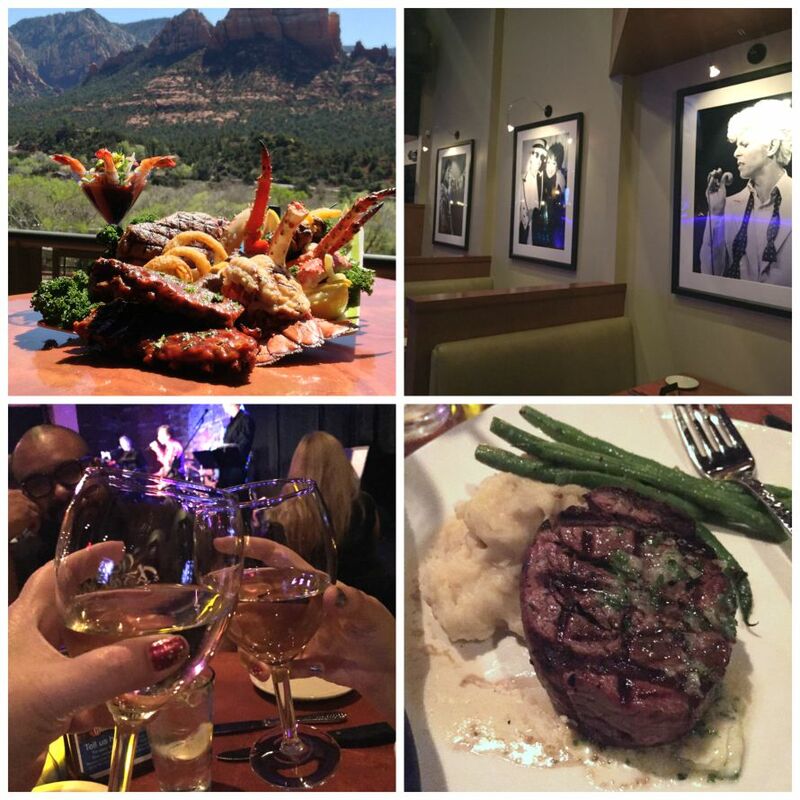 That night for dinner, we headed over to a hot spot in Sedona – Sound Bites Grill. This place is known for its food, as well as the views of the Red Rocks. It also has a large second room were different bands perform every weekend where you can get your drank on, party and dance. When we were there, Eddie Diamond was on deck! 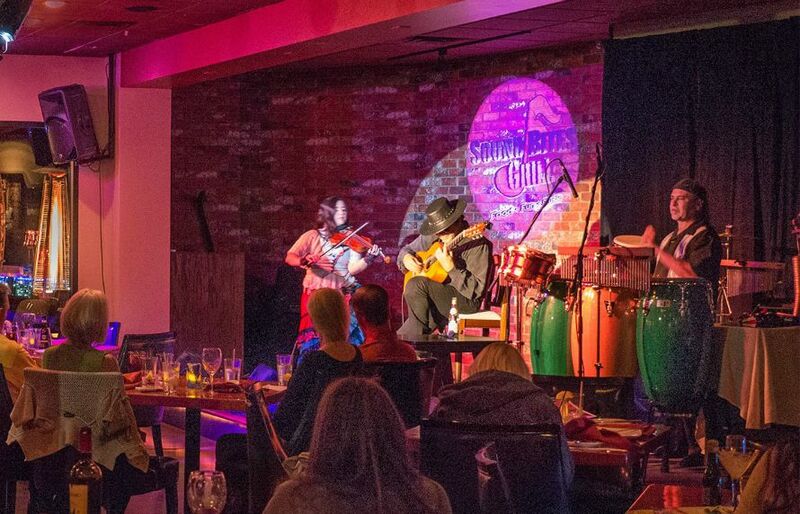 Sound Bites is super fun if you love pop culture memorabilia – think Hard Rock Cafe. Lots of framed art of pop stars, shadow boxes of gear, and more. You can choose to eat in the dining area, or pay an extra fee to see the live music. There’s a dance floor and plenty of seating, great sounds system. I lost track of time, and figured when the show ended it had to be about 11 or so, only to see it was only 8:30! We left, excited to walk the streets of downtown and check out more bands and events, but come to find out, EVERYTHING stops in Sedona at 8:30 p.m.! They even have a name for it – Sedona midnight! I guess the town thinks that once you do all the outdoor activities, shopping, and massages you’ll be ready to crash out and gear up for the next day. OK, this was the portion I’d been looking forward to. In fact, I’ll have another post coming up showing the process of making a bowl on the wheel. Dennis Ott is the director of the ceramics center there and he is a retired businessman who moved to Sedona to reinvent! And he channeled all that happy enthusiasm into the center. 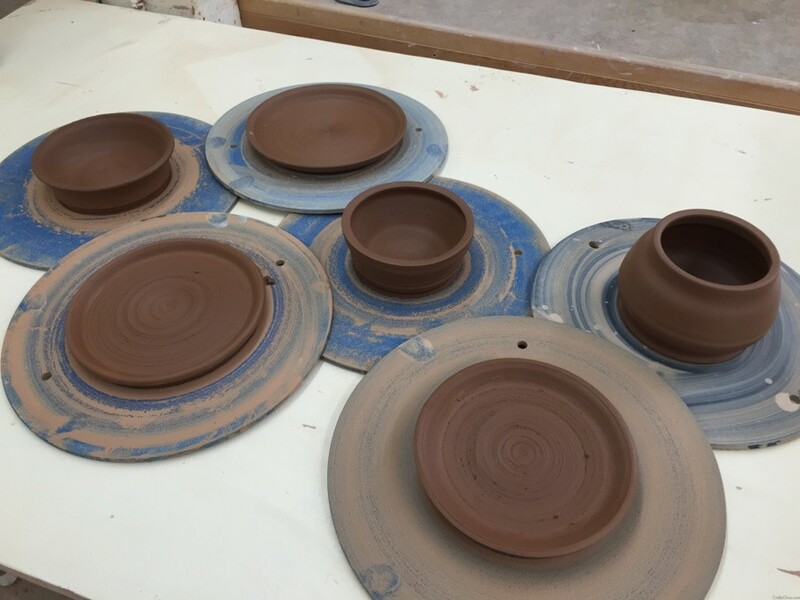 This man loves ceramics – or rather – teaching ceramics! The Center has all kinds of programs to take and if you live in Phoenix, it would be cool to get with some friends and drive up every weekend for them. 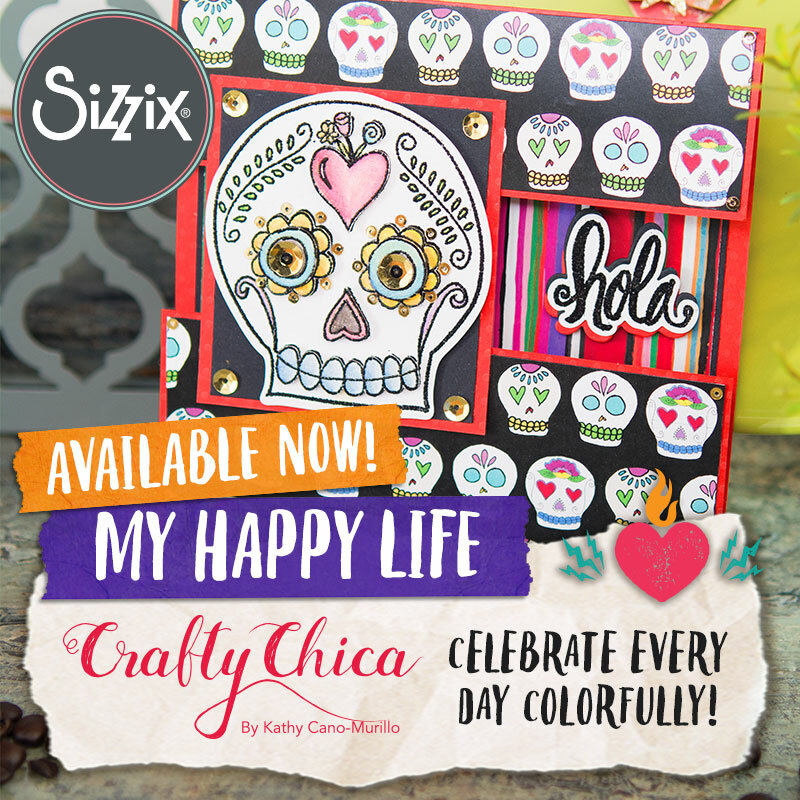 Dennis even asked me about maybe doing some fun Crafty Chica classes, so who knows what will come from all of it. I would love to teach there! Here are the pieces DeAngelo and I made during our two-hour class. I hadn’t worked the wheel since high school and it didn’t take long to get the hang of it again! I just bisque-fired these and am going to be glazing them tonight, so stay tuned for the finished look! Chocola Tree had the youngest vibe of all the places we visited. Very hipster/woo-woo energy here, very Mother Earth, embracing beauty and good health. 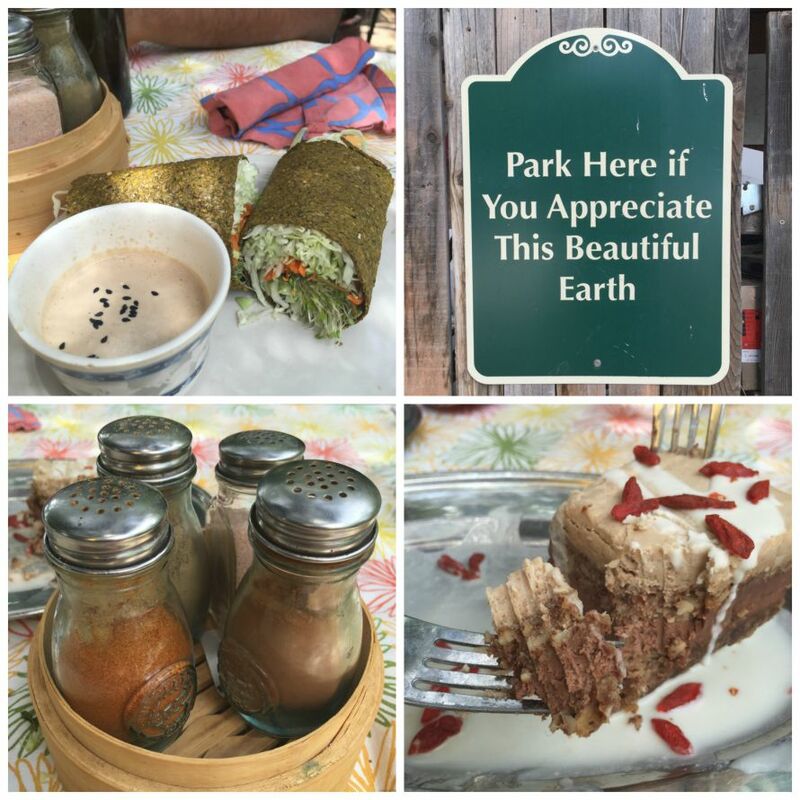 It’s an all vegan eatery that also has books, vitamins, handmade art, a marketplace, music and the best patio seating ever. 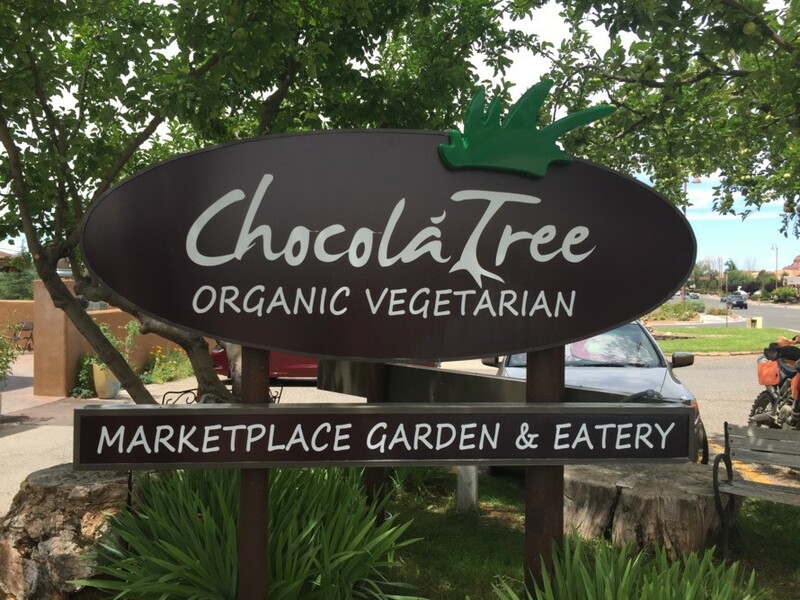 I loved that the employees were very passionate about the message of what Chocola Tree was about. They were eager to help and answer questions, offer suggestions, talk about the art. Organic luxury! Make sure to visit their site because they offer a lot of items online! Healthy, light, yet filling! I love the spices on every table, pink sea salt, cayenne pepper, a pepper mixture and cinnamon! Make sure to order the Ginger Lemonade. As far as food, the menu is very creative, whether you love spicy food or not, they have a nice variety. Patrick tried the Thai Coconut Soup, and I had the Mediterranean Wrap. The desserts are trippy because they are very dense and decadent. This is the place I really wanted to visit, but we just didn’t have the time. I’ve heard a lot about it, I probably would have cleaned out my bank account if we had stopped. But I still wanted to add it to the list so you can make sure to go there if you have the chance! I heard they have a lot of imports and handmade art. I’m already am making plans to return. 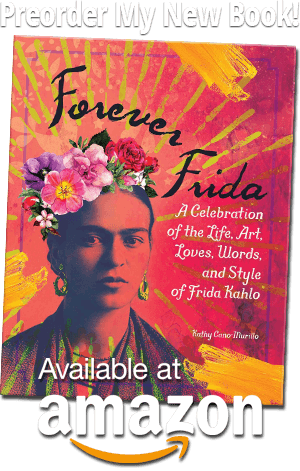 I’m motivated to send art samples to some of the stores, excited to stay at new venues and try the spa treatments. I want to check out the Pink Jeep Tours, and of course Slide Rock. We had planned to go there, but we arrived too late and there was a long wait to get in. 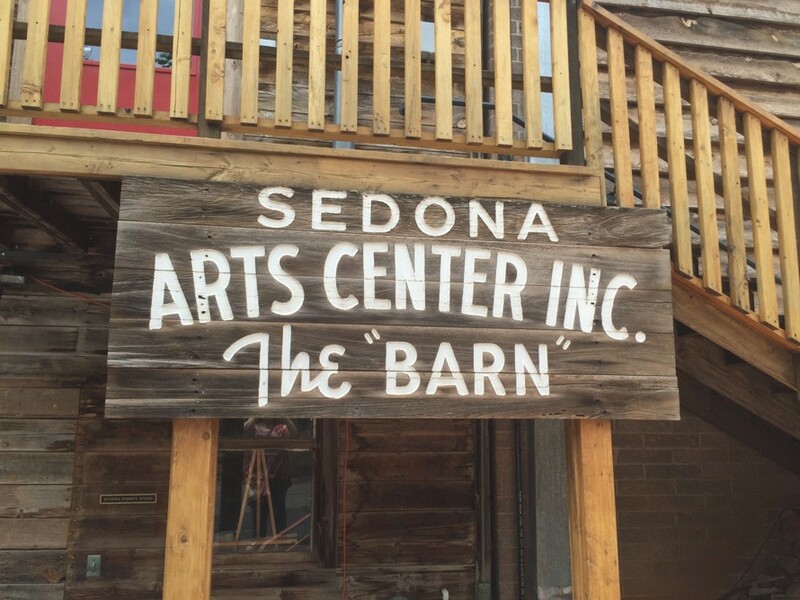 Dennis from the Sedona Arts Center said the best way to go is to go on a weekday, very early in the morning. Otherwise the place is packed! 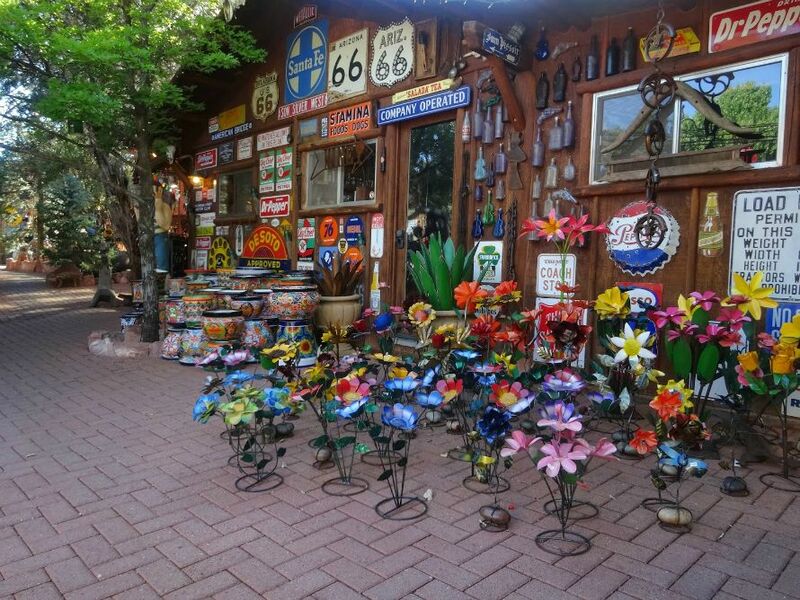 By the way, if you are looking for craft supplies in Sedona, here is a list! 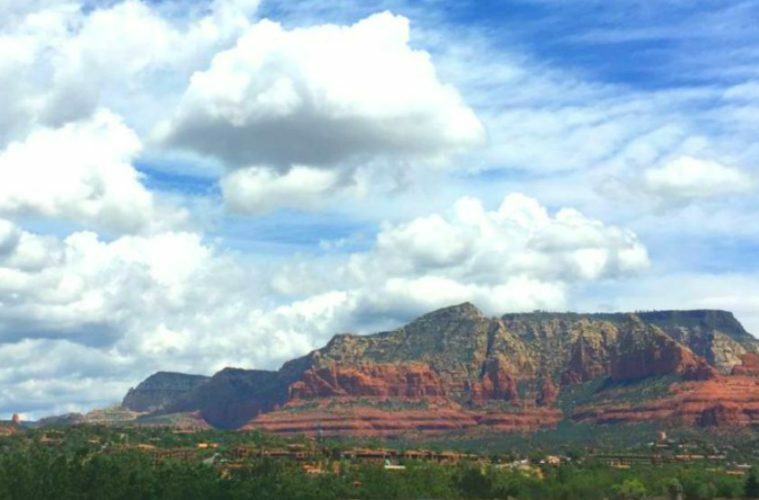 Please share any tips you have about Sedona, what are your favorite stops?